High Net Worth Insights Journal provides insights into the needs and expectations of affluent and ultra-high net worth households, enabling financial advisors to strengthen their client relationships and position their services to attract new business. This monthly journal includes articles and highlights from recent Spectrem research with wealthy households with $100,000 to $25 million in net worth (not including their primary residence). 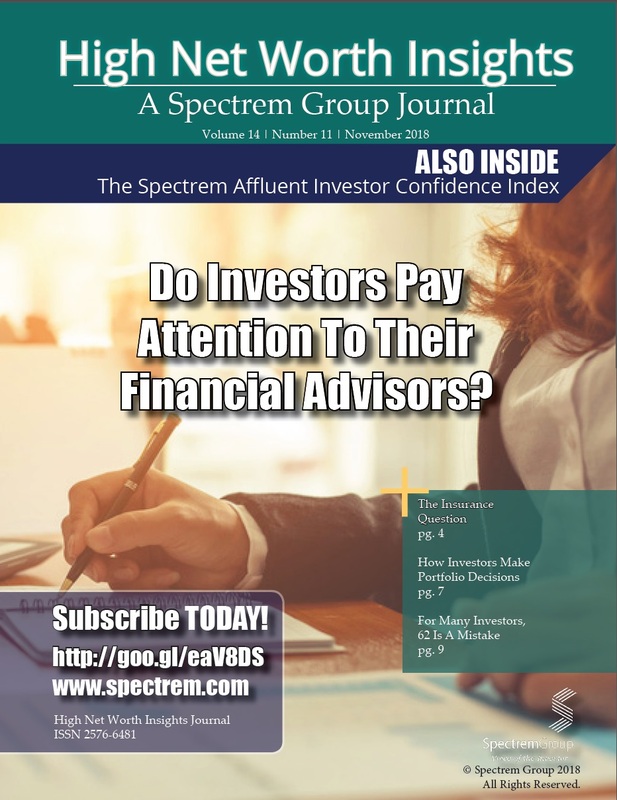 Each issue includes timely articles which exam the results and implications of recent Spectrem research to keep readers abreast of current trends and vital topics among affluent investors. Also included in the High Net Worth Insights Journal is analysis of Spectrem’s most recent monthly Investor Confidence Index, which details immediate findings of investor attitudes about the current economic and investment environment. High Net Worth Insights Journal is an invaluable resource for maintaining an understanding of today’s affluent investor. Monthly subscriptions will be automatically renewed on the date of purchase every month unless we receive a 30-day notice of cancellation. Annual subscriptions will be renewed 1 year from date of purchase unless we receive 30-day notice of cancellation. Price: $245.00 for 1-year, or $30 per month, charged automatically.